Unless you happen to be particularly blessed with a rather zombie-like appearance, you could probably use a few great Costume Accessories whenever you put on your zombie costume. Luckily, the Zombies Playground carries all the zombie accessories you could want, much less need. And that's a good thing, because truthfully, there's a lot that goes into making a great zombie look. It's as much about the look as it is about the mentality, and a good shamble and a classic groan will only get you so far. When it comes down to the accessories, you're going to need things like bandages, fake teeth, and prosthetics, all of which you can find here. And if your hair happens to be too lively, we have undead wigs to fix that. Is your skin not pale or dead enough looking? Lighten your complexion to ghoulish levels with some of our make-up. Need a good wound? Look here for wounds so horrible that even a zombie might think twice about applying them (at least it would if zombies could think). And of course, what good zombie would dare go out without a liberal splashing of fresh blood? You guessed it, folks, you can find all of that and more here in the Costume Accessories section at the Zombies Playground! Zombies eat people, and that's just a fact of life. And given their penchant for eating people, zombies are often covered in copious amounts of blood. Now where could an intrepid zombie fan get all that Fake Blood? Why, they could get it here, at the Zombies Playground, were we keep everything that a zombie would most-certainly love to play with! Here in our Fake Blood category, you'll find a variety of different bloods, all in different amounts, consistencies, and even colors! Why? Because blood isn't just blood. 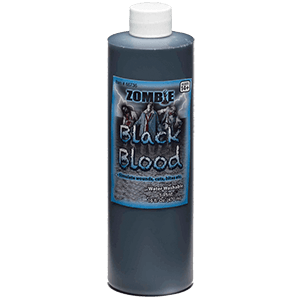 Zombie blood is different from human blood, which is why we offer both fake zombie blood and fake human blood, in varying amounts. And even human blood can behave differently, depending on time and coagulation, so we offer different types of blood for different situations. Need lots of blood for runny arterial spray? Check. Need blood that dries and congeals? We got that. Need a gallon of the red stuff to create a massacre scene? Look here. Need small blood capsules so that your mouth and lips can be stained with the blood of a fresh kill? Yep, we have that too. The moral of this story is that zombies and blood go together like salt and pepper, and any time you need any amount of blood, be it human or zombie, you should look at the Fake Blood you can find here at the Zombies Playground. Unfortunately, many of us (if any at all) were not blessed (or cursed) with authentic zombie looks. So the next time you wish to wear a real zombie face, take a moment to browse through the Costume Make-Up section at the Zombies Playground, where you're bound to find virtually everything you need to create your own home-grown zombie look. And don't think for a second that this category is in any way limited, because there is a lot that can go into a zombie look. Perhaps the most vital thing you'll find here is base make-up that is perfect for crafting your ideal ghoulish complexion, although the fun does not stop there. You'll find oozes, scabs, and fleshes all gathered here as well, to take your zombie look to a whole new level of gruesome and gory with your own home-made scabs, crusted wounds, and gobs of pale, decaying flesh. 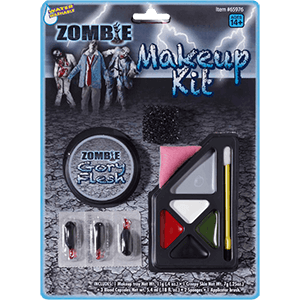 There are even beauty products here that are perfect for a zombie, including things like zombie fingernails and zombie cosmetics, all centered around helping you create a zombie look that will convince the masses that "yes, zombies do exist!" You almost couldn't ask for more, especially when almost everything you need to craft the base of your zombie look can be found in the Costume Make-Up Section of the Zombies Playground. Imagine yourself wearing your perfect zombie costume, but instead of having good zombie feet, you're left with clean, casual shoes that stick out like a sore thumb. It doesn't have to be that way, though, as the Zombies Playground offers Feet and Boot Toppers that will complete your ideal zombie costume. 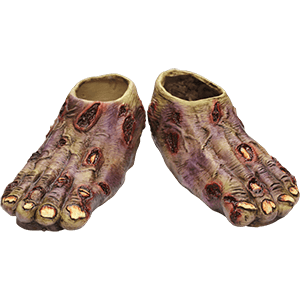 Each of these foot and boot toppers is designed to be worn over your feet and shoes in order to create an eerie and zombified foot that complements any zombified look quite nicely indeed. Some of these foot covers are designed to cover just the tip of the foot, while others are designed to fit over the whole foot, just like a shoe or a boot might. The end result is that each and every one of these impressive covers will transform your feet into ghoulish and ghastly appendages that feature varying degrees of decayed flesh and bone. Heck, some are even completely skin-free, turning your toes and feet into bare-bones skeletons of their former selves! 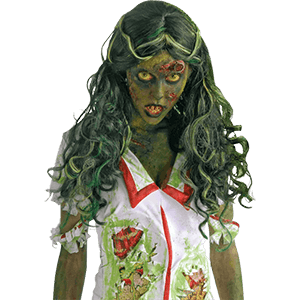 If you're looking for nothing less than perfection when it comes to your ideal zombie costume, don't be caught dead wearing anything but a good pair of Feet and Boot Toppers from the Zombies Playground, or you might find yourself lamenting that missing detail later on down the road. Need a hand? The Zombies Playground is here to offer you one, figuratively speaking. In our Gloves and Hands category, we have a number of impressive gloves and hand coverings that can be worn while you're in costume, ensuring that every part of you is totally and completely zombified. These gloves and hand coverings come in a variety of styles, ranging from zombified to overtly evil to completely skeletal. 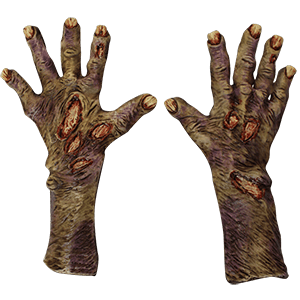 And don't underestimate the effectiveness of a good pair of hand coverings, because as any zombie survivor will tell you, nothing is quite as terrifying as seeing a pair of decaying, discolored zombie hands reaching towards you. In fact, some of these zombie zombified gloves and skeletal hand coverings can be considered to be one of those "little details" that are capable of making or breaking a costume. With a good pair of zombie hands, the costume just works perfectly, yet without them something is irrevocably missing, and the costume suffers for its absence. Don't let there be something missing from your costume, not whenever the Zombies Playground has such a wide assortment of Gloves and Hands available for you acquire and wear with any of your zombie costumes! Do you even need a reason to wear cool zombie gear? Here at the Zombies Playground, we don't think so. Why? 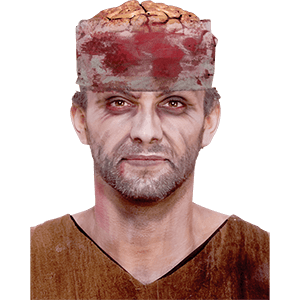 Consider these Zombie Hats for a moment, taking in their comfortable appearance, as well as the way they fuse casual and zombie into one incredible style, and you'll have your answer. 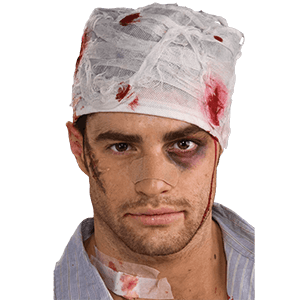 Of course, these hats also happen to make great additions to any zombie costume as well. Many of the zombie hats featured here are simple sock caps, beanie hats, or another styles of headgear that have been merged with a decidedly zombified concept to create something that is as eerie as it is impressive. Just consider the possibilities that these hats open up, and they go from being novel concepts to true gems that could be the highlight of any great zombie costume. There are other uses for these hats as well, though. These incredible Zombie Hats, for instance, can also be worn on a daily basis if you like, although their intrinsic zombie style is bound to give somebody the creeps. Incidentally, the answer to the initial question was, "No, don't need a reason to wear cool zombie gear like these Zombie Hats." Telling zombies apart from humans just got more difficult, especially when those humans happen to be wearing any of the Zombie Masks from the Zombies Playground. Our masks range from classic zombie to undead abomination, ensuring that you can be as monstrously undead as you wish to be with any of our masks. 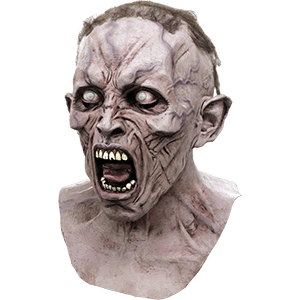 In our Mask section, you'll find a staggering array of impressive masks, all of which feature a monstrous or undead style that is perfect for creating your ideal zombified look. Quality is always important and so many of our masks are made from high-end latex to guarantee their impressive detail and those that aren't are still made from top-rate materials to ensure the best quality possible. The masks found here come in all shapes and sizes, some being made to fit over the whole head, creating a total appearance, while others are designed to cover only part of the head or the front of the face, leaving some personal details showing. If you're looking for a realistic zombie mask, than you can find it here. Conversely, if you want something that is truly monstrous, gruesome, and authentically undead, you can also find a variety of terrifying zombie masks here that border on the truly terrifying side of the walking dead. Of course, there are also a number of other masks that are featured here that might not be totally zombified, but are perfectly in-keeping with a traditional zombie apocalypse and its style. 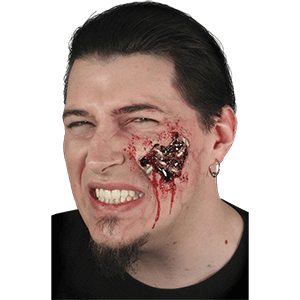 If you're looking for an impressively realistic zombie face to mask your own human appearance with, look to the Zombies Playground to provide you with the Zombie Mask that will leave other living humans quaking in fear of the first zombie they see. Are you cursed (or blessed) with a head of full, luxurious hair, which constantly foils your every attempt to look zombified? If you answered yes, then one of our fantastic Zombie Wigs from the Zombies Playground is the solution to your troubles! Being utterly dead and lacking any form of growth or personal hygiene, zombie hair is often grungy, discolored, and rather wild in appearance, and that is exactly what all of these wigs are. They come in a variety of classic zombie colors, particularly focusing on silvers, grays and greens to create aged and dying heads of hair that will perfectly match up to a zombie's state of rot and decay. And these wigs aren't just for women, as we have short and wild wigs that are perfect for men, too! There's no reason to muck up or mess with your own hair whenever the Zombies Playground offers a wide assortment of killer zombie wigs that will give you a head covered with dead, zombified hair, just like you want!